JonesandBones.com - Gift Gourmet Garden - Saporoso Balsamic Vinegar / 200 Ml. Saporoso Balsamic Vinegar / 200 ml. 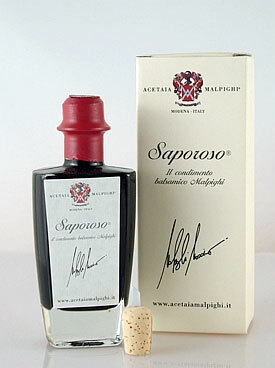 Saporoso...a savory balsamic. Saporoso vinegar is made in a manner similar to that used when making tradizionale balsamic vinegars of Modena. From the Malpighi estate in Modena, comes this barrel-aged Saporoso vinegar. Saporoso is aged 6 yrs. 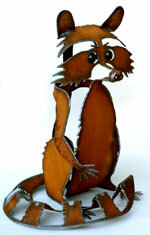 in oak barrels & 6 months in steel containers. Saporoso balsamic vinegar boasts an aroma that is full, intense & a flavor that is tart, with influences of wild flowers, cherries & port. The Malpighi family is known for producing the finest balsamic vinegars in Modena. Saporoso vinegar is made to pair nicely with salad greens, grilled vegetables, in marinades for meats, poultry or game, or as a dessert condiment over fruit or cheese. Malpighi Saporoso balsamic vinegar condiment is aged not less than 6 years. PLEASE NOTE THAT THE SIZE OFFERED IS 200 ml., not 100 ml. Grapes used: Maplhighi Saporoso balsamic vinegar is produced from 50% Trebbiano & 50% Lambrusco grapes. Cooking Method: Saporoso balsamic vinegar is slow cooked in an open container directly over fire.